This book is quite unlike any other. It applies ancient approaches to human types but draws them through to the present day in a vivid and surprisingly accurate way. You will only realise this to be the case when you start reading about what quickly emerges to be your type. Are you a Mars, Jovial, Lunar, Venus, Mercury or Saturn? Once you find yourself, it will become immediately apparent how different you are from other people, and what it is going to take to get along with them better in all walks of life. The Art of Reading People is nothing short of a cheat’s guide to getting on with humanity, and getting the best out of your time here on earth. Enjoy a fresh view of yourself and other people If one book can change your perception of your place in society, and how to get things done, this is it. 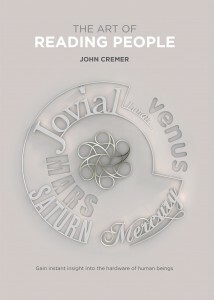 You can buy this in your country by visiting Amazon and searching for “The Art of Reading People by John Cremer”, or click here to buy now from Amazon UK. If you need any additional assistance, or if you’d like to order bulk copies, please contact us, and we’ll assist you in person. Phil, the executive director of the UK division of a mobile phone company.